Enjoy this completely remodeled Chalet overlooking Burnsville Town and surrounding mountains. 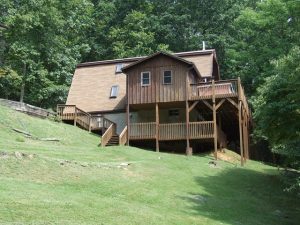 3 Bedrooms, 2 Bathrooms with side screen porch and large front open deck to enjoy mountain views and breezes. Main level access, 2 Bedrooms (Full & 2 Twins) & one full bath on main w/additional bedroom (Queen) & full bathroom upstairs. Ideal vacation spot tucked away, with excellent views of mountains scenery and convenience of in town location. Appliances: Range-Electric, Dishwasher, Microwave & Refrigerator.